You can just make out “1921” on the cross piece at the structure’s top. 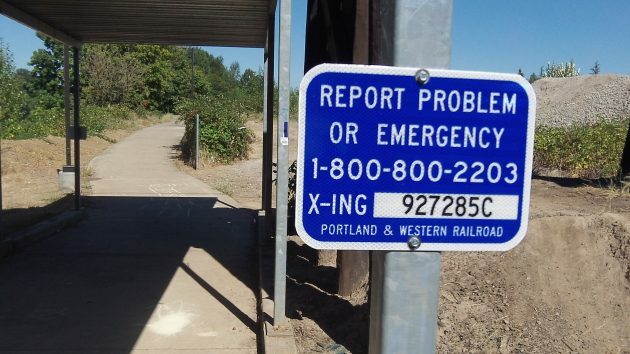 The Portland & Western Railroad is asking people to let the company know if there are any problems at the point where its Willamette River bridge also crosses the Dave Clark Path. I haven’t noticed any problems, let alone emergencies, but a suggestion regarding the bridge itself might not be out of place. I first noticed this sign on the Dave Clark Path a couple of weeks ago. The railroad bridge across the river, if we are to believe the year shown at the top, was built in 1921. That makes it the oldest existing Albany bridge across the Willamette, predating the Ellsworth Street highway bridge by about four years. In about 1998, the owner of the Willamette Queen riverboat asked the Coast Guard to order the bridge opened because he wanted to move his excursion boat from Albany to Salem during a period of high water. The request was turned down, and on the day of the trip in January 1999, the Willamette Queen slipped below the rigid railroad bridge after lowering its decorative funnel. 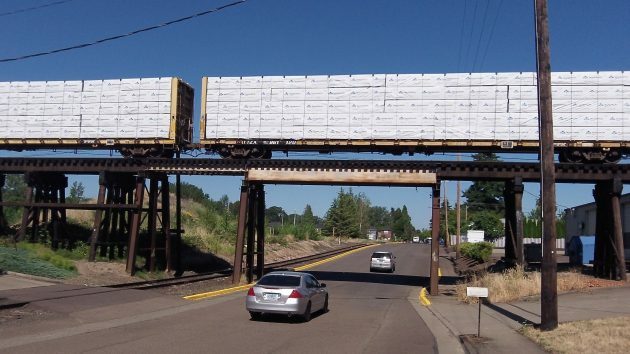 Finished lumber made by Georgia Pacific has just crossed the Willamette River. Is the bridge too far from downtown to fall under the flow of CARA Cash? The old paint is unsightly, but it’s still protecting the steel. Since it’s most likely lead-based, repainting would require abatement. 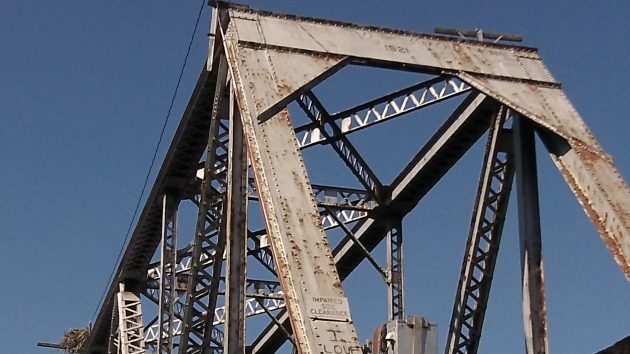 The newer coatings don’t hold up as well, so the old bridge would likely be more damaged by future repairs than by creeping age. Can one not apply paint over lead based paint without removing it first?